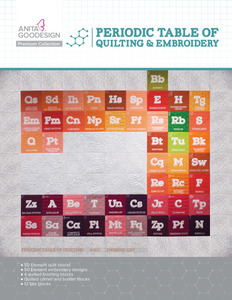 In this collection you will find each element made as a standard quilt block with a fun and unique stippled background. Each element also comes with an isolated design so you can add your favorite element to clothing or home decor. We used a large variety of colors for our blocks so each element can be as unique as the technique or notion it describes. 50 Element quilt blocks, 50 Element embroidery designs, 1 Quilted corner block, 1 Quilted border block, 4 quilted finishing blocks, 12 title blocks.